Joseph is a business analyst intern at Next-Mark. In his role, he analyzes our clients’ business models and goals, creating strategies to maximize their marketing outreach, particularly in digital media. In his first blog for Next-Mark, Joseph looks at what it takes to reach the young adult market today. This fall, more than 17 million college students will go back to school – taking their $117 billion in discretionary spending with them. Once there, their minds will be focused, of course, on grades and paying for the increasing costs of tuition (said the intern who works for his father). Obviously, these young people make up a lucrative potential market, but how do you engage them long enough to convince them of the value of your particular goods or services? As a college student myself, I have first-hand experience as a consumer, of course, but I also can look at it as a marketer. While majoring in finance and marketing at Indianapolis’s Butler University, I’ve learned to look at potential markets in every way they can be diced, employing different techniques to promote brands to each. Diversify: Take a 360-degree approach. – Regarding college students, developing a 360-degree approach means targeting all aspects of where they are viewing; for example, not only advertising in a digital way, but also focusing in on the physical college campuses themselves. – With a busy schedule, college students are eliminating the “fake,” that is, anything with language even faintly reminiscent of scams and get-rich-quick schemes, and looking for facts and real reasons to buy. – Demographics are seldom static, and this age group is one of the more volatile. Use social media to listen to your market and quickly change your tactics and strategies if you find that something doesn’t work. 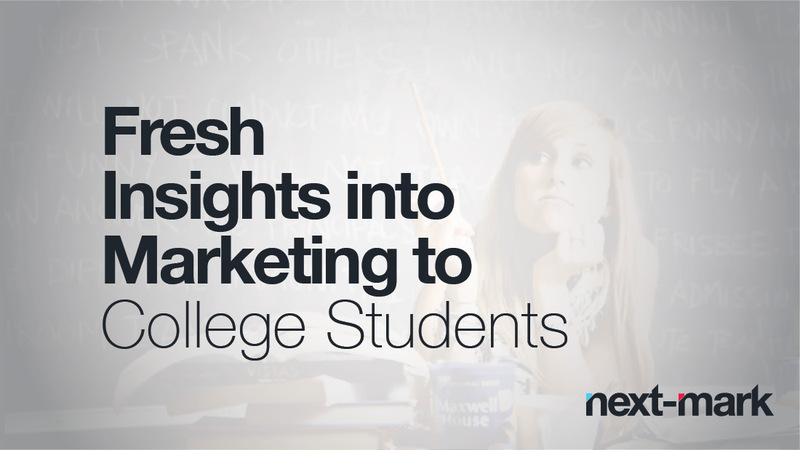 Contact Next-Mark today to learn more about effective approaches to marketing to a college demographic (and the rest of the world as well). Joseph S. Grano, Jr., has a record of success providing vision and strategic direction to organizations experiencing rapid growth and change. He is one of those rare individuals who have made a successful transition from corporate leader to entrepreneur and owner of his own growing company. With more than 25 years of comprehensive marketing communications, business development and public relations experience, he has held key executive management positions in healthcare, technology and financial services. They include leadership roles as chief marketing officer at two public health systems and as vice president of marketing for a health information organization and a pharmaceutical technology firm, in one case leading marketing efforts that grew revenue from $40 million to $120 million. In 2005, Joe founded Next-Mark, LLC leveraging his years of managing award-winning corporate marketing and communications for private, public and international organizations. There, he has built a practice that boasts an international client base representing some of the most noted brand in healthcare, retail and technology, among others. He is a selected member of the Forbes Agency Council and is a regular published contributor on www.Forbes.com. Joe is a graduate of the State University of New York at Buffalo and has an M.B.A. from the F. W. Olin Graduate School of Business at Babson College in Massachusetts. A sought-after professional speaker, executive performance coach and facilitator, he has served as an adjunct professor of business at the graduate and undergraduate levels.